A Tucson metal carport has many benefits, and for some Arizona residents, it is preferable over a garage. The metal carports produced by Desert Steel Buildings are an affordable, and convenient solution for giving protection to your vehicles. While a garage can be locked up and is a good place for storage, a carport is less expensive and can be easily moved. A carport is also the perfect solution for those who have more vehicles than their current garage can hold. You deserve to have the extra protection that a carport offers your vehicles from the famous Tucson heat. You will also soon notice that you won’t have to wash your car nearly as often as you did when it was parked next to the curb. 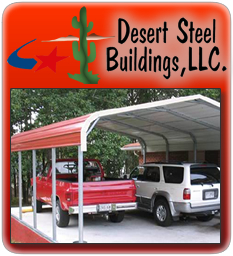 Making sure you find the right kind of carport is our top priority here at Desert Steel Buildings. While one customer may need a carport for just one car, another customer may be seeking protection for their RV. That is why we have a variety of different sizes and styles available to choose from. Each Tucson metal carport is created with your needs in mind, and it can be customized as much, or is little as you choose. We even have several different colors available so that you can truly make the carport your own. We are sure that you will love your Tucson metal carport from the very beginning, but if at any later time after your carport has been installed you decide there is something you would like to change, we will be happy to help. Our dedication to our customers throughout Arizona and California is what makes Desert Steel Buildings stand out from other companies. Don’t hesitate to contact us today, and find out more about our quality carports, and how they will be of benefit to you.